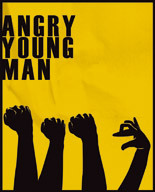 MahWaff's production of Ben Woolf's Angry Young Man is currently taking over the West End from its current home at Trafalgar Studios. The show must end on 2 Feb 08. For more information including ticket prices and show times, please visit the theatre website. Book now online or on 0870 060 6632. Or via 0870 060 6644 for group discounts. "Brisk, funny and slicker than an oil spill in a tuxedo is this charming comedy from writer-director Ben Woolf." Four crisply-suited young actors toss characters between them with jugglers' deftness, leaving the audience breathless with laughter." [It puts you] back in touch with the sheer magic of imaginative, live performance." MahWaff Theatre Company was formed by and involves the highest calibre young performers, writers and directors in British theatre and film. Begun in 1999, it is now an internationally respected producer of new writing. Past productions include GUARDIANS by Peter Morris, which won a Scotsman Fringe First at the Edinburgh Fringe Festival 2005. Based in London, MahWaff exists to produce innovative theatre which is challenging and accessible, entertaining and relevant. MahWaff wishes to be your waff. Our award-winning, sell-out, critically acclaimed Edinburgh world premieres - ANGRY YOUNG MAN and GUARDIANS - have been produced at leading venues nationally and internationally. Folliowing its Fringe First-winning success, GUARDIANS had a three week run at Theatre503 ('Britain's most important theatre' - Lyn Gardner) during which MyAnna Buring won a Fringe Report award for Best Actor in a Political Drama. GUARDIANS is currently running off-Broadway at The Culture Project (directed by Jason Moore). ANGRY YOUNG MAN transferred hot from its Edinburgh triumph to the Battersea Arts Centre (BAC) before beginning a UK regional tour. It returned to London to perform off-West End at the Tristan Bates Theatre. It was co-produced by the Holden Street Theatre to play at the Adelaide Fringe Festival 2006, where it won both top awards of Best Play and The Advertiser Best Show Overall.